To begin my journey in learning the BERNINA PaintWork Tool and Software, I went to my local hobby shop and picked up a few inexpensive pieces to play with. The first item that caught my eye was a child’s apron. The cost was less than $3 so there wasn’t a large investment if I messed it up. 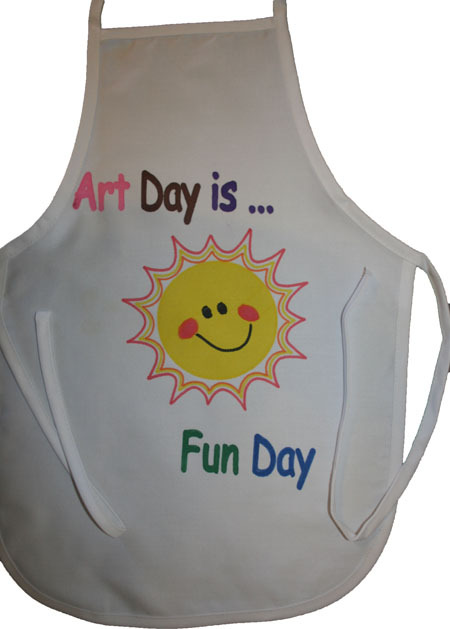 Even though I don’t have small grandchildren that can benefit from this project, I’m sure I will find a child that will be thrilled to have a new art apron. 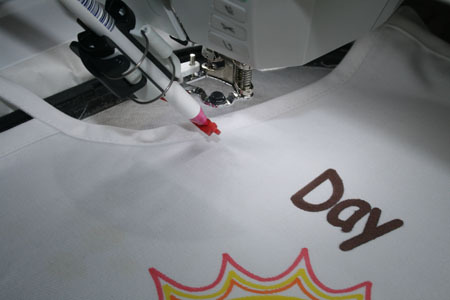 The sun design that I used on the apron is an OESD Signature Collection appliqué design (Baby Applique Sun #CM376_48). Using BERNINA Embroidery Software 6, I easily converted the design to a vector file to provide a crisper image for working with PaintWork. After the vector file was created, I opened it in the DesignWorks software and quickly created the PaintWork design file. I was amazed at how easy it was to change an embroidery design to a PaintWork design. BERNINA PaintWork Tool in action. The lettering was Comic Sans and the only adjustment I made was to change the density. The density of the lettering was at 3.0 and I changed it to 1.2 to give a more solid fill to the letters. Following a tip from Amanda Whitlatch, “DesignWorks guru,” I used a fill and an outline on each letter for a smoother look. 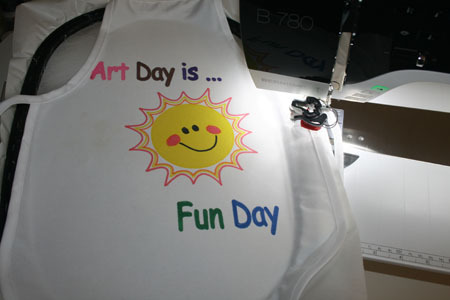 Art day (play day) is not just for kids! We too have toys that we love to play with and my new favorite one is PaintWork! My next adventure will be playing with the CrystalWork and without a doubt it too will be added to my list of favorites. Visit your local BERNINA dealer for more information about the accessories used in this project.